"Mommy, are there crabs at this beach?" "No Honey, this is a river, not the ocean. Crabs can't live here." "It's just not the right kind of water for them." "What about shells? I'm going to dig to find some." "There aren't any shells here either, Sweetheart." "Yes there are, look! I found one!" "Hi Sweetie, glad you're home. What's...what's that smell?" This seems to be a common topic in our bedroom. Mike leans over sleepily to inspect my decorated foot and ankle. I was at a bellydance party. These things happen. "Yes! I'm going to go dry it a bit with the hair dryer before I come to bed, and then wrap it for the night so it'll get nice and dark." I'm an overachiever. I can't help it. "Won't it flake off in the bed overnight?" 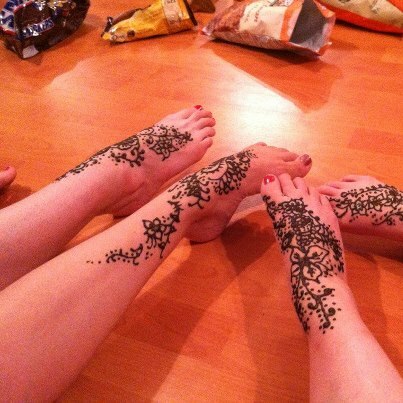 I'm sure there are worse things that could get in our covers besides dried henna.